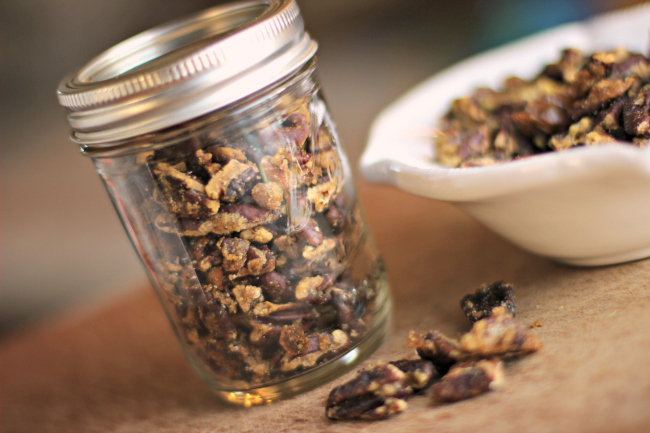 Here is a quick and easy recipe that you can keep on hand as a snack, to serve to your guests, or give as a gift, too! Louisiana pecans. We LOVE them! This recipe is a wonderful mix of our beloved pecans, two kinds of sweet sugars, a sass of seasoning blends, and then a kick of curry to top it off. It is just the right blend to excite all your taste buds. 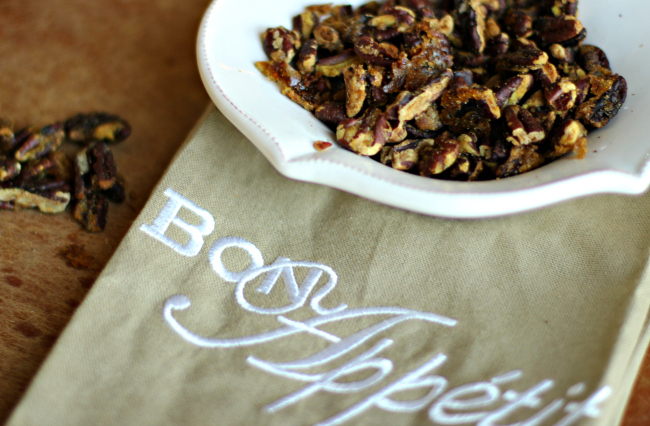 These Sugar and Spice Pecans from River Road Recipes IV: Warm Welcomes, page 255, will make a lovely gift for a hostess, teacher, or neighbor. Be creative with packaging: mason jars, cello bags with ribbons, pretty tins, or maybe a antique candy dish. Just use your imagination. You could also pair the gift with a pretty tea towel like in the picture below. Toss the pecans with the butter in a bowl. Add the mixture of the sugar, brown sugar, seasoning blend and curry powder to the pecan mixture and mix well. Spread the pecans in a single layer on a baking sheet. Toast at 275 degrees for 45 minutes, stirring at 15-minute intervals. Remove the pecans to a plate and let stand until cool. Store in an airtight container.